5mm Hub-Centric CNC-Machined Billet Wheel Spacers with a 5x120mm bolt pattern by VAC Motorsports are one of the most cost effective upgrades to your BMW. Not only will you give it a more agreesive look and stance, you will also be upgrading the handling. 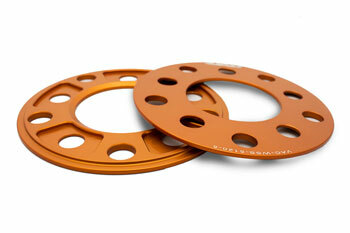 VAC Motorsports - The BMW parts innovator introduces our latest Wheel Spacer Version! Our 5mm BMW wheel spacer set contains works of precision art. We don't set out to make just any BMW parts, everything we do must carry our name and we take pride in always improving our product; we want to offer the best. With that, we have our latest revision perfectly crafted, 5x120 & hub-centric wheel spacers. Our spacers have been around for years with nothing but happy customers on and off the race track, and even now they continue to improve. Whether your looking to get your wheels perfectly tucked under your fenders, or to add clearance for a big brake kit; our spacers will fit your needs. Hub centric on both hub and wheel side (recommend extender below for 5mm and 8mm): tested for ZERO wobble - confirmed at close to 200MPH! Our BMW wheel spacers are sold in pairs of (2). Fits all BMW 5x120 cars with 72.5mm hub flanges. Does not fit the 74mm hub on E39 or X5 E70-on, see our 12mm, 15mm, or 20mm sizes for these vehicles. VAC BMW Wheel Hub Extender for 72.5mm – Highly recommended for this wheel spacer, makes wheel installs a breeze!